The debate about teacher or pupil-led teaching has to stop, for me it is “wrong jungle” thinking. There are both teacher centric and student centric approaches that work, the research evidence is pretty clear. Equally both approaches have some pretty uninformed and dodgy practices that unfortunately have find their way into our classrooms. What’s needed is a more balanced view including teacher led practice with opportunities for co-operative strategies intertwined in them and co-operative or independent work with high quality teacher input. Teacher-led strategies are useful to efficiently deliver factual knowledge, help students become unstuck when they hit a brick wall in their understanding and when learning new strategies to help them become more independent. It’s important to say form the outset that this is not the same as didactic teaching which involves a teacher stood at the front talking, with students sat down not listening. Direct instruction is a very carefully planned process involving seven steps – see Hattie, 2009, Visible Learning, p. 205-206 – from where the structure below is taken and the quotes. 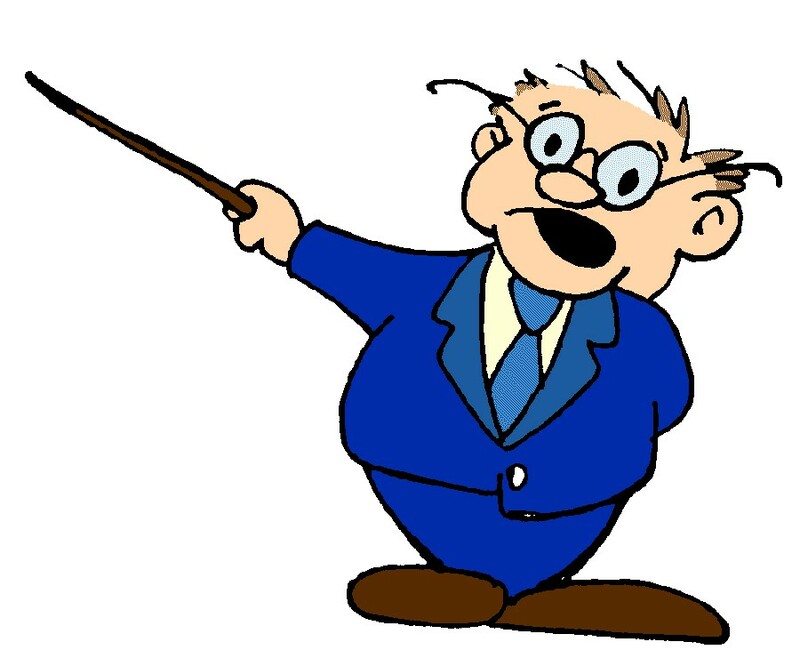 If you are currently more comfortable with a teacher-led approach in the class room then direct instruction is for you. Use the steps below and work on are honing your skills until the structure becomes second nature, both for you and the students. The important difference, between direct instruction and didactic teaching, is the former requires the active engagement of students within the learning process. They cannot just sit there passively whilst you talk. Step 1 – Before the lesson, structure and sequence the learning the learning intentions must be totally clear in your mind if they are going to provide a clear framework within the lesson. Are they challenging & moving to increasingly deep learning? The SOLO Taxonomy is excellent for this. You need to think about: factual & conceptually learning, subject procedural knowledge and metacognitive knowledge. If you want to make this a bit more active why not give the students the lesson intentions on a set of sorting cards and ask them to organise them from unistructural to multistructural, to relational and finally to extended abstract. This could be “Think” part of a Think, Pair, Share with students asked to explain and justify to a partner the order they placed the learning intentions in. These cards can then be left on the table in front of the students as an aide memoire for the rest of the lesson. Step 2 – The teacher needs to be clear about the success criteria in his/her own mind and then make them explicit to students – what does excellence look like? Remember to make your success criteria specific, extensive and challenging. If you want to read a bit more about Teacher Clarity including specific, extensive and challenging success criteria have a look at “When #SOLO Met Bloom”. Don’t fancy doing all the work? Why not give students three completed examination questions, from another class or the previous year, at different levels. The task is to work in a small group to determine which answer is best and articulate why – these can then be converted into set of success criteria for the work about to be completed. Step 3 – There is a need to engage students in the learning – John Hattie talks about a “hook” to grab the student’s attention and I’ve heard Alistair Smith refer to this as a fascinator. You want to focus student’s attention on the learning. My only bit of advice is do not to spend too long at Step 3, it’s the starter not the main meal. At the end of each lesson a student is given the job of researching the next lesson and bringing a fascinator along to hook the other students into the learning. Step 4 – This is the part of the lesson with some teacher input, modelling and critically checking for understanding. It’s important in direct instruction that the teacher actively checks whether the students have “got the learning” before moving on to guided practice. This stage may have a relatively low challenge as you work with students on the process used to get to the correct solution; it is really the start of “drilling” the process used. You don’t allow a student to move on until s/he has mastered the process. If you do you are building on foundations of sand. This is the teacher bit, your input will be vital but keep the talk to just the right length. Cover the key information and process but don’t go on too long. Let the students move to step 5 and even struggle a bit, if you’ve got the level of challenge right they should. Don’t be afraid to oscillate backwards and forwards between steps 4 & 5 if needs be – as either whole class or small group intervention. Step 5 – Students need the opportunity to demonstrate their grasp of the new learning by working through an activity or exercise. The level of challenge can be increased as the student becomes increasingly familiar and confident with the new process of learning. Critical to this phase is the teacher’s presence – check, check and check again that each student has grasped what is required before letting them out of your sight. Think about structuring the exercise, for example in a Maths lesson, into four sets of ten questions. Each set of ten contains questions are at the same level testing one particular mathematical aspect, however, each set gets increasingly challenging as a new element is introduced into the question. The final set of ten questions may be a set of mathematical problems which require a series of processes to be used to successfully solve them. Students work in pairs to answer either the odd or even numbered questions within a set and then have their answers checked by their partners – they don’t all need to do all ten, the spare are used for extra practice by a student who doesn’t grasp it. Why not allow each student to decide which level of challenge s/he wants to start at and pair students accordingly. Keep your eye on the students’ work and move them up or back a level of challenge as necessary. In an English lesson, studying a particular text, why not ask students to work in groups and mind map a different character each or a thread/section of the plot. Students are required to present the information to others in the group who then critique and add to the information presented. Each student must then produce a written piece on the characters – compare and contrast them or explain how they are interconnected within the plot – or describe how the different threads of the plot interconnect/produce a timeline of the full plot. Step 7 – The final phase is practice, independent from the teacher, which could be home learning or group or individual work in class. It is important that the learning is applied in new contexts. Sometimes, when I watch lessons, I see a teacher going around the houses with a 101 different activities to convey a basic set of facts – they are focussed on the activity and not the learning. This just isn’t necessary or time efficient. It is absolutely vital that students know these facts as they form the basis for deeper understanding. However, by spending so much time on the surface knowledge the lesson never gets to the relational or conceptual understanding that should and could have been achieved in the time available. 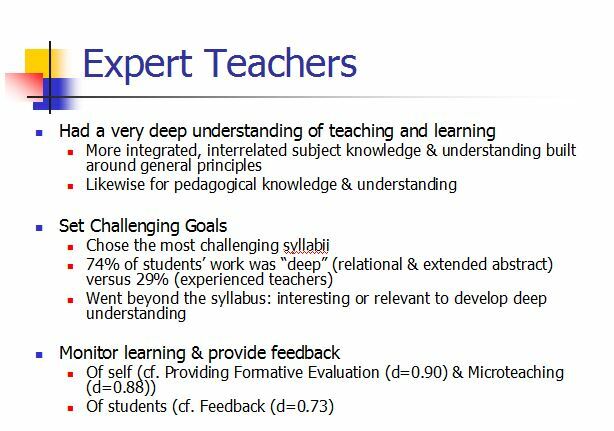 Interestingly, “expert teachers” spend 74% of their time on this deeper understanding in their classes yet they must still cover the factual work (research by Ayers et al. quoted by Geoff Petty) It’s different for, what the research labelled, “experienced teachers” who spend their time differently on more surface/factual knowledge. Write the facts on the board, get the students to copy them in their books and learn them – or at least this would have been my “old fashioned approach” with the odd banda sheet thrown in (if you know what this is you are of a certain age!) The latest equivalent of this approach would be the “flipped classroom” where the basic factual learning is completed by the students prior to the lesson – they need to know the facts – and then spend time within the lesson looking at the relational connections between this factual information and hopefully building a conceptual understanding. A didactic approach for simple factual knowledge can work but a far more co-operative style – either teacher to peer or peer to peer – with the discussions that ensue is required for deeper understanding. We need to own the knowledge and the thinking. If you are not familiar with Hattie’s work he took a whole series of educational activities and interventions and put their impact on achievement on to a single scale (d) for comparison purposes. A d=0.40 was average and then he ranked about one hundred and fifty of them in order. The information I have put in brackets is the d scale followed by the rank. Great comment. Thanks for adding.